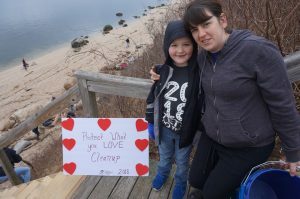 On February 10th, 2018 83 volunteers showed up for our first ever North Fork beach cleanup. 67 Steps Beach is on the north shore of Long Island, and is located almost directly south of the Connecticut River mouth. This beach, among many on the north shore of Long Island, is highly impacted by marine debris. When we first arrived at this beach, we couldn’t believe our eyes. So, we called in the troops and organized one of our most successful beach cleanups to date. 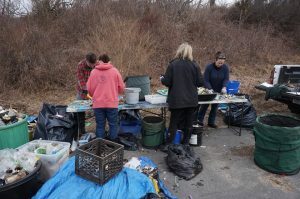 After three tireless hours of cleaning a half-mile stretch of beach, 83 volunteers managed to remove 1,100 pounds of trash from 67 Steps Beach in Greenport, NY. Totaling in 1,100 pounds of debris removed from our coastline! Powerful before and after photos taken by Emily Kappelmier. After the clean up, all of the trash is brought to the counting station, to be tallied and sorted. Surfrider now keeps a database to develop a better understanding of which particular items are found most commonly at cleanups. 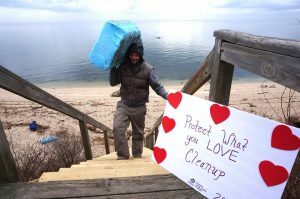 Cariann Wood, a graduate student from Stony Brook Southampton who helped organize the 67 Steps beach cleanup. Thank you so much to all of those who lended a hand and helped us promote the 67 Steps Beach Cleanup. We hope to deepen our roots within the north shore community, so please join us at our first ever North Fork Chapter Meeting on Thursday, March 15th 6pm in Peconic @ the Greenport Harbor Brewing Co. Facebook event with info here. For info about all of our events coming up, check out our calendar. Long live plastic-free beaches!